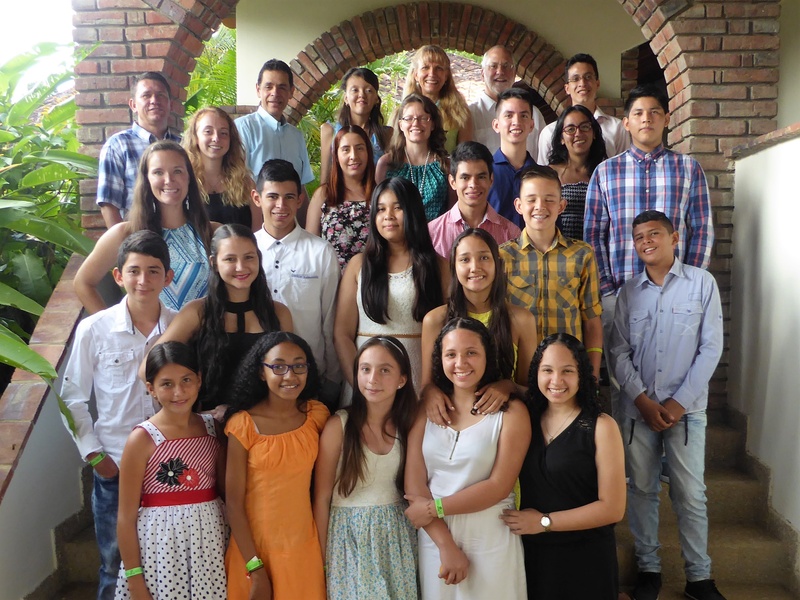 For the third year, the 2017 Colombian camp was held at the Hotel San Gil del Campo just outside of the city of San Gil, Santander, Colombia. Campers and staff at the United Youth camp in Colombia. This was our fifth year for camp in Colombia, with a total of 16 campers, six staff from Colombia and four staff from the United States—two of which were the Colombian pastor and his wife. We experienced delightful cooperation, camaraderie, and unity among the campers and staff. This centrally located city makes travel to camp easier and less expensive for all who attend. Hotel San Gil del Campo is affords an absolutely peaceful and tranquil location with vistas of mountains and valleys covered with a variety of green vegetation. The temperature was comfortable too. Campers and staff stayed in hotel rooms and ate together in the dining hall that provided three meals a day (from onsite grown vegetables and meat). Each day started with a compass check and ended with a Christian living class or a Bible activity. The UYC theme of “Building Your Relationship With God” was used to keep us focused. Building bonds of friendship with our spiritual family was a huge part of camp. Plenty of time for fellowship and relaxing is an integral part of this camp, allowing time for bonding and renewing friendships. For the Bible skits campers were divided into groups and assisted by staff. Each group selected a Bible story and wrote a skit based on the camp theme. They practiced during free time and were performed later on. The skits covered the stories of Abraham, Jonah and Joseph, and were entertaining and enjoyed by all, including the invited hotel staff. Courtney Horvath organized the amazing race, which had everyone running from one part of camp to another to complete various exercises—both physical and mental. Capture the flag and Frisbee football were two new field activities and were enjoyed by all. Montana Hermann provided water balloons for all to enjoy. For the first time, we had a dance class. Janet Salek taught the line dance “Cotton Eyed Joe,” and David Sierra taught basic steps for merengue, salsa and vallenato. On the Sabbath, camper Ronaldo Medina did an excellent job of leading songs and giving announcements. David Sierra gave a sermonette and Colombian assistant pastor Jaime Salek gave the sermon. After the Sabbath, everyone was able to practice the new dance steps at the dance. A collection of songs from Colombia and the United States kept everyone enthusiastically dancing from 7:30 to 11 p.m.
A bus trip to Cascadas de Juan Curí was on Monday. The ecological park is nearby with gorgeous views of the 650-foot waterfall. The steady rain during the walk to the waterfall did not diminish enthusiasm. Most all of the campers and staff made the strenuous climb to the upper falls to enjoy time swimming in the frigid pool at the base of the falls. Blessed with peace, cooperation and a spirit of camaraderie, deeper bonds of friendship were built among the campers and the staff. We look forward to returning to this tranquil gem of a location next year. A hearty thank-you to brethren who gave generous donations to allow youth to attend and experience an uplifting atmosphere and growth opportunity with others that would be difficult without such help. We are also very grateful to Good Works for providing the funds to fly our two bilingual, Spanish-speaking staff from the United States to help us this year! Gayle and her husband, Scott, live in Spanish Fort, AL. She enjoys running, playing the flute, camps, and travel.